Is it possible to install scripts to autoload that way? Yes, just drop the scripts into ~/Library/Application Support/X-Chat Aqua/. Can’t wait to try this – you should see if x-chat.org will post this build or something! wow thank you very very very much even the smallest update for this application is long time over due. I just use Mac for 2 months. i usually used MiRC in windows and edit the remote script as much as i want, especially to block and ignore spammer automatically. So i can chat free of spammer. 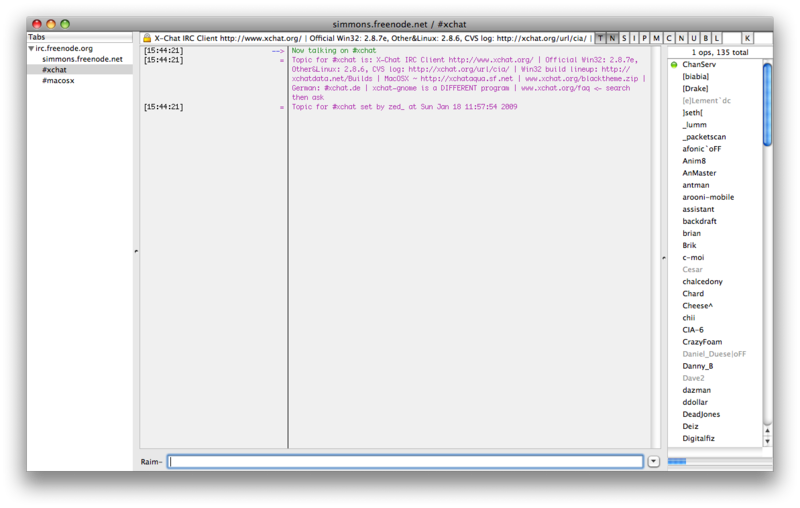 with mac i’ve tried several irc programs, but xchat aqua is the simplest and very user friendly for switcher like me. however i still dont know how to edit or how to load script to xchat to suit my need. You would have to write your script in one of the supported scripting languages. Then you would put that script into ~/Library/Application Support/X-Chat Aqua/ to get it loaded automatically at startup. You can also use the /load and /unload commands to test your script. There is also a GUI in the menu under Window > Plugin and Scripts. How come the version you’re offering is the 0.12.0 when 0.16.0 is the latest in official website? It is not 0.12.0. I just was not aware that the version number needs to be changed. I build this from source as found in the SVN which is incorrectly labeled as 0.12.0, that’s why. Actually this should not follow the release numbers as it is an unofficial build. So let this be the 2009-01-21 build done by me. If there is the need to make another release, I will consider changing the version field for the about box, too. Okay, got it. Anyway, do you know what are the changes between the latest official release and this one? Thank you very much for the much needed update to XChat! My version, built from SVN is 0.17.0. Also, the 2009-01-21 build contains an executable from november of 2008. I do not write many scripts for X-Chat, so I think you would be better off with the official docs. Thanks for the X-Chat build! For anyone who might find the scrollback/logging feature that’s on by default a pain, the way to turn it off is to either type “/set text_replay off” in a window, or edit ~/Library/Application Support/X-Chat Aqua/xchat.conf to have the line “text_replay = 0” in it. Please report bugs to the sourceforge.net project (forum or tracker) and not to me. I am only offering this build, but I do not work on it. it’s including a localized interface (german looks good so far) and some more fixes/features. Any way you can fix the “scroll-tab complete” feature? It’s broken in OS X 10.6. X-Chat Aqua has a new maintainer, please send requests directly to him. I installed 0.17. and both 0.16 and 0.17 will freeze sometimes. it will still function but the window will freeze and i can’t see myself type or what others are typing. this happens due to netsplits most of the time when there’s too much going on too fast for the client. i guess too much data at the same time will make it go crazy. Im using snowleopard by the way. can ANYONE tell me how to fix this or can anyone fix this bug? it’d be a waste of a client with this issue. oh if anyone has some info or help, please email me at poyan.pirouz@gmail.com . thank you. You could try building your own X-Chat Aqua from ToePeu’s github branch, I recently submitted a patch which could have addressed this problem. But there is no new binary available yet. Can someone explain to me why I can’t figure out how to ignore people in X-Chat Aqua? I mean, it seems incredibly convoluted.